According to reports from Spanish media outlet, AS, Florentino Perez wants former boss Jose Mourinho back at Real Madrid but the rest of the board members do not support his ideas. Madrid are going through an abysmal season considering their sky-high standards. Los Blancos are out of the Champions League and the Copa del Rey after humiliating defeats at the hands of Ajax and Barcelona respectively. Los Blancos also suffered four consecutive defeats at home for the first time in the 21st century, which includes a loss against Girona, two defeats against bitter rivals Barcelona, and a 4-1 humiliation against Ajax. Los Blancos are third in La Liga but sit 12 points behind leaders Barcelona. 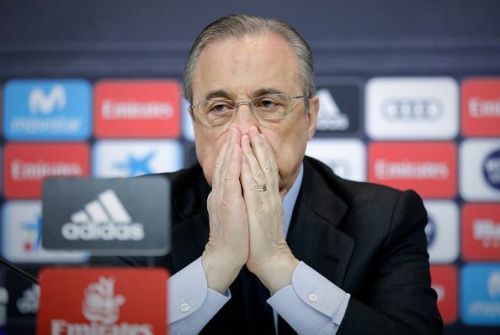 It goes without saying that Madrid are likely to finish their season without any trophies, which is absolutely unacceptable for their board and fans alike. Meanwhile, Mourinho is without any club at the moment after getting the sack from Manchester United a few months ago. The Portuguese tactician was Madrid's coach for almost three seasons - from 2010 to 2013. Despite winning titles with the club, Mourinho left the club with a bitter taste in his mouth. The fate of the current boss Santiago Solari is decided, as Florentino Perez is already planning his next move. The names of Jose Mourinho anZinedinene Zidane top Perez's wishlist, but there are problems with both of them. While Mourinho clashed with some of the stars which include Sergio Ramos and Karim Benzema, Zinedine Zidane won't take the charge of the club immediately. According to the report, José Ángel Sánchez, the general director, is resisting the move of Mourinho back to Madrid. The rest of the board members also insist on going after the coach of the German National team, Joachim Loew. Mourinho is currently without a job and Florentino Perez is desperate to make changes, which makes his return likely. With only the La Liga to play for, Madrid will face Real Valladolid and Celta Vigo in coming weeks.